Click here for audio of Episode 224. Today, we meet the great communicator of 19th-century English mathematics. The University of Houston's College of Engineering presents this series about the machines that make our civilization run, and the people whose ingenuity created them. 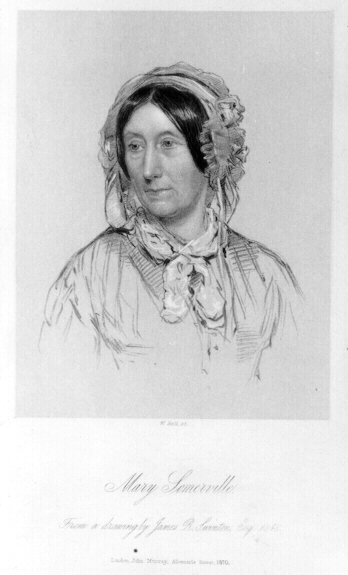 The great Scottish authority on math and science, Mary Somerville, died in 1872. She was then 92 and writing a book on quaternions -- the 19th-century form of vector analysis. She was also reviewing a book on finite difference techniques. This powerhouse of British intellectual life was raised in a small town on the Firth of Forth. Without a school to go to, she ran wild -- chasing seabirds, gazing at stars. Her education was catch-as-catch-can. Then she found out about algebra and geometry. That was like a match in a tinder box, and her parents were horrified. A passion for mathematics could drive a teenage girl insane. Her self-education began in earnest when she was 27 -- after her first husband died and left her some money to live on. Six years later, she wrote a prize-winning paper on diophantine algebra. She also married an English surgeon who held no stock in 19th-century attitudes toward women. By the time Mary Somerville reached her late forties, the French had come to the end of a brilliant period of mathematical work. The British were far behind. In 1827, the Society for the Diffusion of Knowledge asked her to write an interpretation of Laplace's work on celestial mechanics. The book, Mechanisms of the Heavens , established her as a great interpreter of 19th-century analysis. She wrote four such treatises, and they helped reshape English mathematics and science. She was 89 when she finished the last one. By then England was the world's scientific leader. By then the name Somerville graced a College at Oxford, an Arctic Island, and several society medals. She was the red thread through the fabric of England's rise to power. Her understanding seemed to be limitless, and she corresponded with every great French and English mathematician of the age. For example, she was a close friend of Charles Babbage, who invented the first computer. During the 1830s, Lord Byron's daughter Ada learned mathematics by the simple expedient of pestering all the great minds of the day. Mary Somerville tutored her for a while -- then Babbage took her on as a pupil. Nothing has [so persuaded me] of the unity of the Deity as these purely mental conceptions of [mathematics], which have been by slow degrees vouchsafed to man [and] which must have existed in that sublimely omniscient Mind from eternity. Of course those were also the words of someone who deeply loved the mental flights that she made for almost a century. Osin, L.M., Women in Mathematics . Cambridge, MA: MIT Press, 1974, pp. 95-116. Stein. D., Ada . Cambridge, MA, MIT Press, 1987. For another take on Somerville's biograp;hy, see Episode 1934. Additional material on Somerville is to be found in Episode 828.